Crevice - "Lullabies For Little Albert"
Crevice is a 12 member ensemble from Texas (having expanded from the original trio) that includes members of Pseudo Buddha, Cooperation, Six Fing Thing, Dreamland and probably a slew of other bands I'm not aware of. I won't even try to list the instrumentation used on this album except to say that the entire inside of the liner notes is a laundry list of instruments, devices, efx and everyday household objects. The CD consists of 4 lengthy untitled tracks, though titles are of little concern as Crevice keep things moving and shaking for a full hour of non-stop spaced out fun. Track 1 opens with warbling drones, ambient waves, syncopated patterns and textures reminiscent of Ash Ra Tempel and Tangerine Dream, along with wailing saxophone, violin and a wild and sometimes hysterical assortment of tape manipulated voice samples. But that's only the beginning. The music is continually developing throughout the whole album, like evolution at 78 speed, changing moods and themes after mere moments. 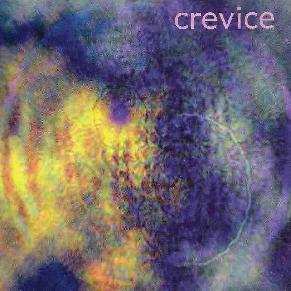 But despite the frequency of the shifts, Crevice succeed in maintaining a sense of cohesion, doing an excellent job of blending avant-garde sound-art with space rock, krautrock, prog rock, electronica and ambient stylings, and adding orchestrations and other fun embellishments along the way. There's way too much happening here to dissect it all, but along the way we encounter a heavy driving prog-psych jam, a wailing jazz-punk jam, freaky frenetic studio manipulations, cosmic alien space excursions, trippy mind-expanding psychedelia, and more more MORE!! Wow, what ride! In some ways the studio manipulations remind me of Vas Deferens Organization. But Crevice really sound very different and cover far more stylistic territory, though the tendency for wildness and wackiness is on an equal plane. Ultimately, however, this album is impossible to accurately describe. There's a seemingly endless array of twists and turns that you just have to hear it for yourself. But if you like virtually everything we cover in Aural Innovations all wrapped up into one beautifully crafted space collage, then step right this way. A truly psychedelic experience. For more information you can visit the Uncle Buzz web site at: http://www.unclebuzz.com. Contact via snail mail c/o Uncle Buzz 5014 Arbor Ridge, San Antonio, TX. 78228.